Romain Grosjean's switch to Haas for 2016 was all but confirmed on Sunday. 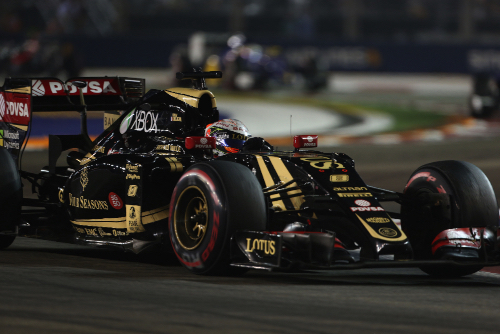 It is well known that Lotus, Grosjean's current team, is in detailed talks with Renault about a buyout. Those discussions obviously sped up throughout the Singapore race weekend, aided by the Renault ambassador Alain Prost. But the F1 legend insisted: "Nothing has been decided yet." And Prost also told German television Sky on Sunday: "I will not be the team boss." Also interviewed on Sunday was Renault's F1 chief Cyril Abiteboul, who did admit that talks between the carmaker and the Enstone team are looking promising. It is rumoured, however, that the new Renault works team will not have a French driver next year, as Grosjean is said to have decided to switch to Haas. Abiteboul told France's Canal Plus in Singapore that a French driver is not a necessity for an international company like Renault, but he also admitted: "It is a shame that we cannot talk about Romain."